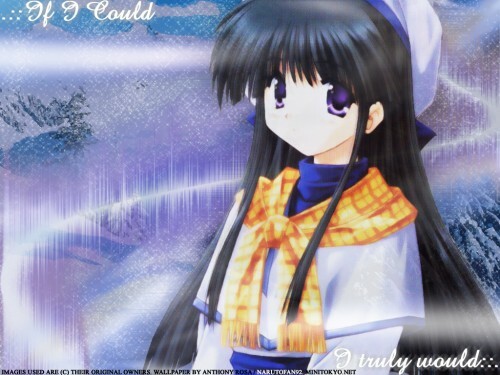 Snow (Visual Novel) Wallpaper: . ::If I could I truly would::. Minitokyo »	Snow (Visual Novel) Wallpapers » Snow (Visual Novel) Wallpaper: . ::If I could I truly would::. Well this is a wallpaper that I finished while I was in the car on my way back from a conference in Florida. I had started it before but you know I had extra time and thought I would finish it. The wall has 26 layers and it's basically quite simple. It had more layers at one point but I merged them. Anyways, the Background that is slightly visible is a vector of a winter scenery. It wasn't supposed to have a snowy look to it at first but that's how it turned out. The words really have nothing to do with the wall but i thought I would put them up either way. Please give me your criticism. I really appreciate it. Browse Snow (Visual Novel) Gallery: Recent | Popular. hmm, me again, wow, this is really something else... tranquil feel and it's blue!! +fav and slaps on desktop. Pretty and calm...^^ I really like it that way. The only problem I can see is that your words are slightly "stuck" to the edges of the wall, which is never a really good thing to do. The good thing, however, is the girl's scarf which brings a nice highlight in all of the cold shades. Really cute. And you're getting better with every wall you make... Nice job@! Nice wallpaper! I love the winter scenery in the background. But the scan of the girl looks a little grainy, the scan could be cleaned a little. But it's pretty good anyways. Good job!